You can post comments on your shared items in FeedSquares now. When you share an item, a comment box will appear and you can click "Add Your Comment" to add a comment. We have also added "Your Shared Items" and "Your Starred Items" to the wall. You can access them by a single click or with the keyboard shortcuts "g then shift+s" and "g then s" respectively. By default only the Friend's shared items are shown. You can add more squares for quick access. Hope you like it! Port it to Safari PLEASE! What about adding an option to hide the squares that have no unread items? I love the FeedSquares extension. However I am having trouble customizing it. I am using Chrome on a netbook computer. When I use FeedSquares for Google Chrome on a full size monitor I have no trouble customizing. Not sure why? 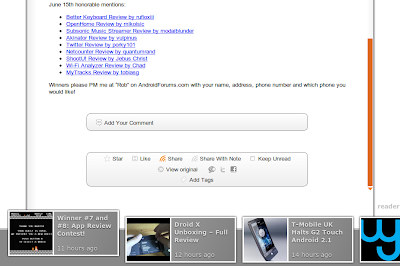 Seriously love this add on the chrome and android since it just makes reading the feeds better. How about doing something for buzz? 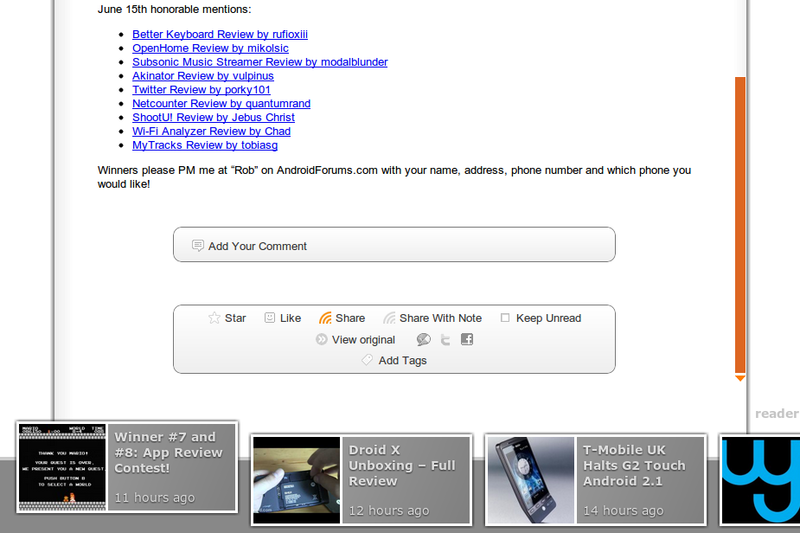 @Rafael You can click "personalize" at the bottom of the screen, then toggle "read feeds visible". @JD Do you mean the option buttons at the bottom are not visible on your screen? Can you send us the screen resolution? @all Thanks for your comments! This is the second time I have installed and then uninstalled this. I like the way it looks and works. My problem is that I have to scroll side to side to find all the unread feeds. I want to have the main page only display unread feeds, so I can quickly see what is new since last time. My screen resolution is 1024x600. It is on a netbook computer running Windows 7. @Harrlet You can click "personalize" at the bottom bar, and toggle "read feeds visible" to hide the feeds with no unread items. @JD Thanks, we will have a look at the size. Oh and I should note that this is intermittent. Sometimes it loads no problem, but other times I have to refresh. @Fashtivator Oh that's right, if FeedSquares is loaded on Chrome startup, some essential Chrome functionalities may not be ready yet. Refreshing should do the trick. Hey, loving the new update. I was wondering if it was possible to extend the extension so I could make an application shortcut of Feedsquares so I could pin it directly to my taskbar? I would love to be able to just click on a button and directly access Feedsquares. I think what Rafael and Harriet wants is for the icons to actually go away / move to the edges instead of just grey out. A horizontal scroll bar on the posts that need them. Absolutely love this extension and the Android app! Is there a way to do a popout podcast player, similar to the basic Google Reader's "Popout" link? 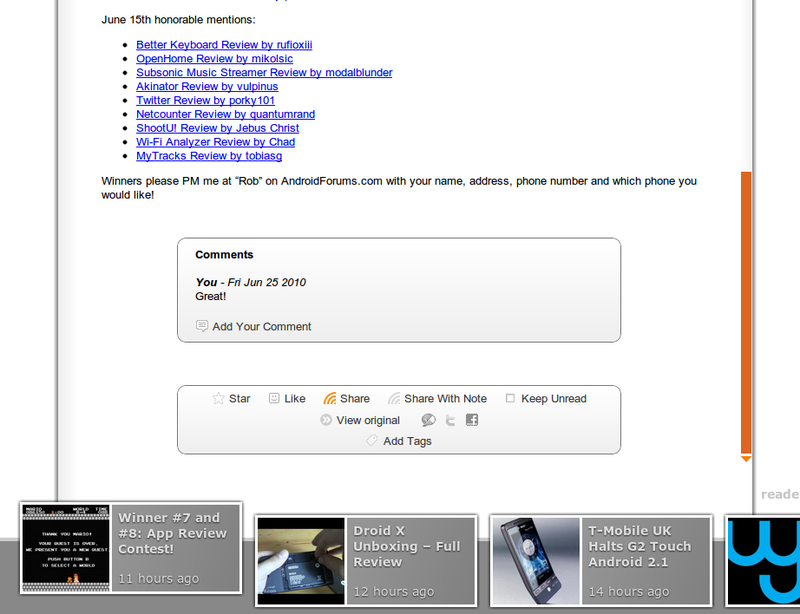 Could it be possible to have a porting of this essential ext to safari 5? Could you add to the bottons at the end of each post (star, like, share, share with notes...) the button for a fast, simple printing of the post as we read it on your ext? - When the FQ tab is pinned in Google Chrome you should have your own FQ custom icon. - The other issue I found is it does not save the settings for the refresh on feeds. It always resets to 15 minutes if it is set to 0. If this is by design I will understand. - The Top Picks, Rocket in a Bottle, and About Us should be toggled on/off in the settings. - I noticed that when I have Google Reader beside FQ that when I finish reading things in FQ that Google Reader when I click on the "unread" bold areas are not cleared as being read and have to be refreshed. Might need to improve the syncing as it also applies with new subscriptions and folders that are created in Google Reader. Hopefully this feedback can be used to better improve your extension, so far I am overall pleased with it. Thanks for your feedback! We are going add an icon to the tab in the next version; as for the refresh interval, it has minumum value of 1 minute. We will consider adding more options for the interface too, thank you. Thanks for the reply I really appreciate it, btw I tried the 1 minute refresh feed, but it does not seem to actually refresh. I left it running in the pinned tab and I noticed it did not update the count until I either clicked reload feed or refresh (F5) the screen. Might want to check on that when you can. Thanks, we will have a look at this. great extension really really congrats i feel really comfortable in it. I miss manage subscriptions, searchs and hotkeys. We have added hotkeys support, you can see http://blog.rocketinbottle.com/2010/06/feedsquares-for-chrome-is-updated-10.html for a full list of hotkeys. We will consider adding manage subscription or search in a future version, thanks. Please add an option to remove "Top Picks" from the deck of subscriptions. It is not something that I subscribe to and it makes it incredibly difficult to know if I have anything new that is actually important. I turned on the number of unread posts for the icon in Chrome and it reads over 800 because of the Top Picks. Hi, I think Flipboard does pretty the same job as FeedSquare but it's on iPad. What is your comment on Flipboard? Could you please provide your email address so I can write emails to you? Thanks! 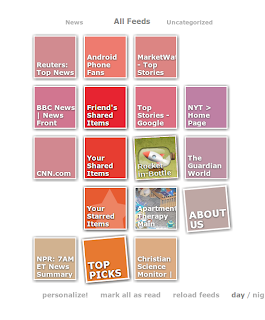 @Ryan Hm, Top Picks is an aggregate of your subscriptions plus your friend's shared items. At least that's what Google says. @Adamzhu1986 Haha, I don't think we are doing the same job. Flipboard is a bit 'Feedly'/Magazine IMHO. You can contact us at rocketinbottle AT gmail for any suggestions you have! - I also would prefer that any unread feeds would completely disappear instead of just greying out. I don't want to have to scroll back and forth to find a feed that as an unread item. - I'm not a fan of having the number in the corner of the feed be clickable. I accidentally click on that number sometimes and all the stories get set to read. An option would be nice to turn that off! 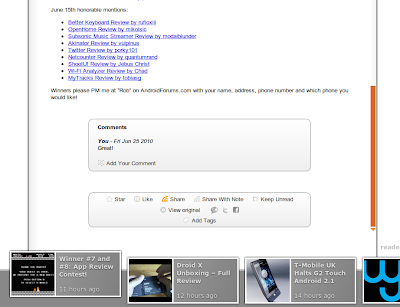 - Why does the layout of the feeds change each time I reload? I'd like some sort of organization that either is customizable or at least stays the same all the time so I know where a feed is located. I use a lot of folders for my feeds. Would it be possible to organize the squares into columns by folder instead of having a link to show the feeds in the folder? If you can't do that, can the squares just stay in the same place every time you reload? Also, I love having the notifications in the toolbar. Can you bring notifications to android as well? Thanks! Love this extension. By the way, why FQ instead of FS? That always confuses me. I really appreciate your application! - The number in the corner of the feed: I accidentally click on that number sometimes and all the stories get set to read. An option would be nice to turn that off or application have to ask a confirmation dialog. - Your application show about 40 items for feed and after "View more....", it could be nice to have a button "Mark theese items as read" as in Google Reader for Mobile. So i preview the first 40 items, read some and mark other as read and after i can take next 40 items. @Kaikko Thanks for the feedback, we will consider these in our next versions! i want to change the size of font, could you add this function? Hi, I'm switching from feedly to FeedSquares extension.. just have one issue.. could you please add an "ESC" keyboard handler to close the current feed being read ? hi, love the extension. however, i was disappointed to discover that the extension doesn't autoload the next bunch of feeds, but rather forces some form of reload (which includes re-clicking the relevant feedsquare). also, i don't know if this is possible, but i would like to be able to use the google reader sorting options (oldest, newest, magic). last but not least, i would like to see the current feed count for even while reading an item. at the moment, the window with the feed contents blocks the squares layout, where the feed count is displayed. thanx for the great extensions and keep up the good work. 1. Does the interface auto refresh when I receive a new feeds? I look at the extension icon, it shows increment in unread feeds. But on the interface, there's nothing happen. Only after a few minutes, some of the square glows which I believe that square got a new feeds, but it doesn't show how many new feeds for that square. Only after I click 'Reload Feeds' that new glow square shows the unread number. 2. How does FeedSquare prioritize which square at left, center or right? Most of the square with unread feeds were located at the center, but I see some square is at the most left of the interface eventhough it also has a new feed. It would be nice if any square with new feeds being moved to the center especially when I subscribe a lot of feeds. 3. Most of my feeds got images in their post. But I see that only some square show the images. Is that a bug? 4. Is there any plan to release a desktop version? 1. Auto refresh the interface. And if there's a new feed on certain square, move that square near to the center area. 2. It would be nice if the built-in player can be like Youtube or Google Reader's built-in player, where user can pause and let the audio fully loaded before play it to avoid buffering. It seems like FeedSquare built-in podcast player did not download the full audio to the browser cache before play the audio, which sometimes become a problem for me because of slow connection. When I pause the player, my bandwidth meter shows nothing is downloaded. I like this extension. Thanks a lot. I would like it if it would either highlight the folders containing any unread items or perhaps put a number of unread items in the folder on the corner, like you did for the boxes. It would be better if you add one more feature, "view in background"... maybe with the hotkey "shift + v". @andyKamezou: 1. There is no auto refresh yet, to get the latest unread count, you can reload the page. 2. To save traffic and CPU, FQ does not reload the subscription unless you click 'reload feeds' or when Chrome launches. 3. The squares are ordered by click frequency. 4. There is no plan for desktop version yet. @ALL: Thank you for your suggestions, we will consider them. Al heel wat bedrijven hebben verwoede pogingen gedaan om zoekreus Google naar de kroon te steken met een eigen zoekmachine . Telkens was de moeite tevergeefs, en zo ook wellicht blekko. maar de originele werkwijze van blekko maakt het toch een vermelding waard. & Google chrome wint de browseroorlog . Chrome nr 1. neem aub eens een kijkje op www.misdebusniet.be . great extensions - one thing i noticed, however - the unread count on the icon doesn't work on RockMelt? please make this extension for safari,i use both browsers, safari and chrome and so it will be good to have this extension in safari too. I would love to be able to change the font size.